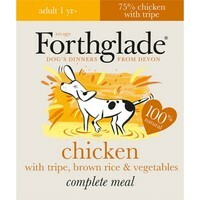 Forthglade Complete with Brown Rice Dog Food (Chicken, Tripe & Veg) is a natural and wholesome meal for adult dogs aged from 1 to 7 years old. Made with easily digestible and extremely tasty ingredients, the recipe has been gently steam cooked over a long period to ensure it retains as much of its nutritional benefits as possible. The food can be enjoyed on its own or given as a complement to a balanced diet. Brown Rice – Easily digestible and packed with natural nutrients. It is also a good source of dietary fibre.